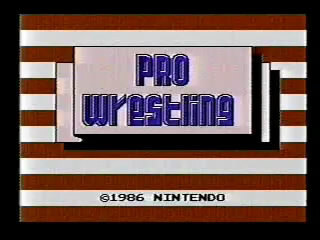 In the year of 1986, a winner is Pro Wrestling. Best time: 0:06:00 by Andrew Gardikis on 2009-09-12. Alright, so I finished a ringout speedrun in 6:00 according to the total game time. I'm satisfied with that time, considering a perfect time is 5:52. 22 seconds per match for 16 matches. I thought this run would be a bit easier. Still, I think a few odd things happened so it might be an amusing run. I'll admit, the run is pretty repetitive. It's interesting to see how fast it can be completed and how easily the opponents can be taken advantage of. My main strategy is to throw them (or have them throw me) our of the ring as soon as possible. 22 second matches require near flawless execution + a bit of luck. - one 24 second match. Forgot to mention... I used Giant Panther as he was annoying me most while speedrunning. Choosing him made it possible that I didn't have to face him. As in this game, you can't face the character you are using. I might attempt for a "perfect" 5:52 run someday, maybe in a few months. I am satisfied with this time for now though.